What is it? 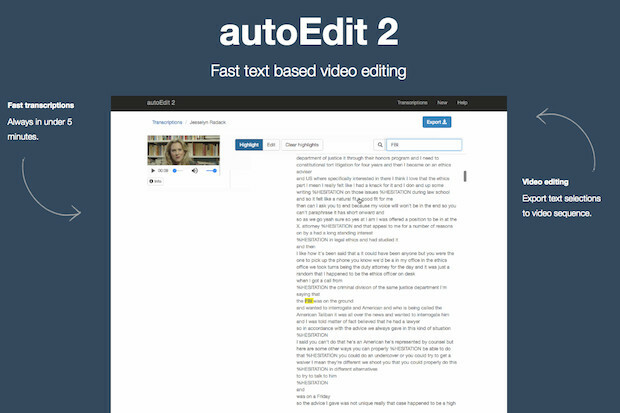 AutoEdit is a text-based video editing tool, developed as an open-source project by Pietro Passarelli with the product team at Vox Media, where he is a 2016 Knight-Mozilla Fellow. How is it of use to journalists? The purpose of the tool is to speed up the process of how journalists use transcriptions to produce and edit videos, and to make it easier to add captions. Both these tasks currently involve journalists producing the transcriptions and captions manually or by using third-party services that can automate the process. Reporters who want to produce shorter videos or sound-bites from a longer interview have to spend time watching or listening to the entire file to find the quote or sequence they are looking for. From the user research he conducted with video staff at Vox Media, Passarelli identified a few common scenarios in which autoEdit can help reporters save time. For example, the tool can help video producers who are looking to create shorter videos from longer pieces by generating an edit decision list (EDL) that can then be imported into software such as Adobe Premiere or Final Cut Pro to generate a video sequence. It can also be used by journalists to quickly double-check a quote's accuracy using the transcription generated, or to save time on manually transcribing entire video and audio interviews for articles such as Q&As. Cost: AutoEdit is free, but it needs to be integrated with a transcription service. There are free options available, but depending on the option chosen by the publisher, a one-off or monthly cost may be incurred. All the resources needed to install the program are available on GitHub and Passarelli provides a user manual that explains the process step by step, with screenshots. AutoEdit has been configured to provide two options for the automated transcriptions, the IBM Watson Speech to Text system and Gentle. Users can pick which one they want to use, or tweak the code to incorporate their preferred transcription service. It's worth noting there are a few differences between the two systems available. IBM Watson is a pay-as-you-go service, offering customers 1,000 free minutes of transcription per month, before charging $0.02 for each additional minute thereafter. It is also available in multiple languages and when linked to autoEdit, it can transcribe files of any length in approximately five minutes. Gentle on the other hand, is an open-source, free system which works offline on any computer. This could come in handy for journalists transcribing sensitive files, Passarelli said, such as interviews with whistleblowers, where they might not want the material to be accessed by a third-party. The downside is that it produces less accurate transcriptions than IBM Watson, which will require heavier manual editing, particularly if you are planning to use the text for the purposes of captioning. This option is also slower – it took Journalism.co.uk about 10 minutes to generate a transcription for a 10-minute audio file. After you decide which option you'd like to use, choose an audio or video file from your computer, add a title and an optional description, and wait for the transcription to be generated. The time-coded transcription will appear, and the corresponding audio or video material will be shown on the top left. Clicking on a word in the text will play the corresponding sequence, and if you spot any discrepancies, hit the 'edit' button to correct the text. There is also a search bar to look for specific keywords in the transcription. The 'highlight' option in the menu allows you to select an unlimited number of quotes or phrases that you would like to include in a video sequence. Once selected, they will be underlined in blue and you can click 'export' on the top right, where you will be given several options. If you've selected two consecutive quotes for example, you can export your selections in a chronological order as they appear in the video, or in the order you have made them. Whichever option you choose, autoEdit will produce an EDL file, that you can then open in a video or audio editing software of your choice together with the original file, which will automatically produce the video or audio sequence selected earlier. If you're using the tool to generate captions for a video, you will be able to export the transcription as an SRT file. Vox Media also has a separate open-source tool available on GitHub, Captions Burner, where you can overlay the subtitle on a video file and create a short captioned video or GIF for social media. And if all you're after is the transcription, the tool can provide it in a plain text or timecoded plain text file. AutoEdit is still under development, so if you encounter any bugs or would like to provide further feedback, get in touch with Passarelli and the team by emailing info@autoEdit.io.